I had baked an Almond cake with chocolate frosting and buttercream icing for the midnight cake cutting celebrations, the day before. Come morning, breakfast was simple, old-fashioned oats with fruit and nuts, just as usual like every other day. I had some idea on the menu for lunch – Kaduhu Ohre (kaduhoo oh ray) was surely one of them, it was his favourite after all. What I was undecided on was the dessert, goes without saying that I wished to conjure up something special eh? And then, there is a tradition back home, to make a payasam of some sort on festivals or for special occasions such as these. Even as a series of payasams made their entry and exit through my mind, I wasn’t quite convinced. What if I extend the almond theme to lunch as well? Some Medjool dates that I bought many days ago lay in silent meditation inside the refrigerator. How about showing them the path to salvation? Quite the choice, I quickly concluded. I made a mental map and a rough sketch of the ingredients, the method etc. One quick to-the-point call with my mom and a little googling later, my plan turned out concrete and ratified. Although, I won’t deny the temporary dilemma I was in, over Kheer* or Badam Burfi (Almond squares – popular Indian dessert) instead? You now know which prevailed! 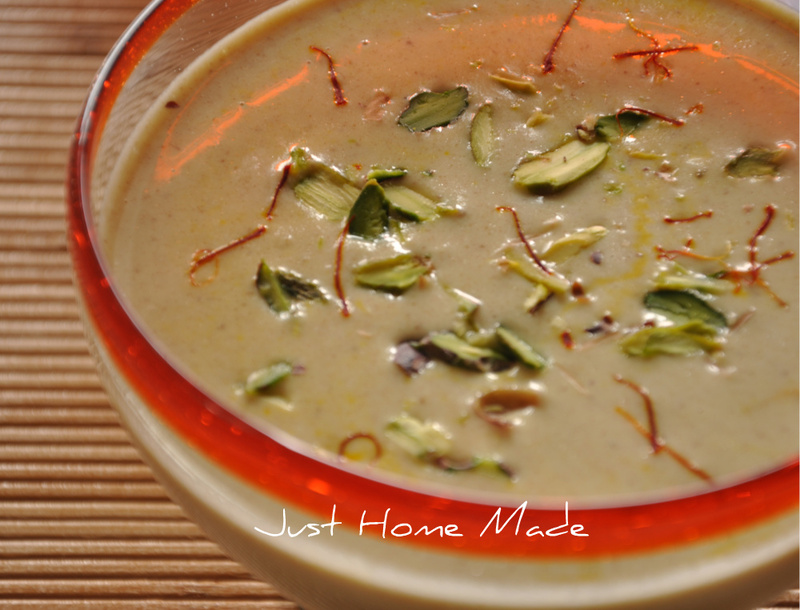 Kharjoor Badam Kheer – An extremely exotic looking (and tasting too, don’t worry) yet deceptively easy to prepare dessert and a sumptuous one at it (of course, after all the expensive ingredients, it better be!). The crunch of fried cashews playing hide and seek in between the silky nuttiness of the almonds laced with the sweetness of the dates, the luminous sunset orangey hue of the saffron and rich fragrant aroma of cardamom makes this dessert almost divine – if you have someone you wish to wow, this ought to be your choice.. Him and I and even our guest for the day Miss mmj loved it puddingy thick, suit yourself though – make it thinner if you so like it. After all, any food tastes best when tailored to one’s picky palette and individual nuances. To blanch the almonds, place them in a bowl, pour boiling hot water and let sit covered for about 5-10 mins. Discard the water and run cold water over them. 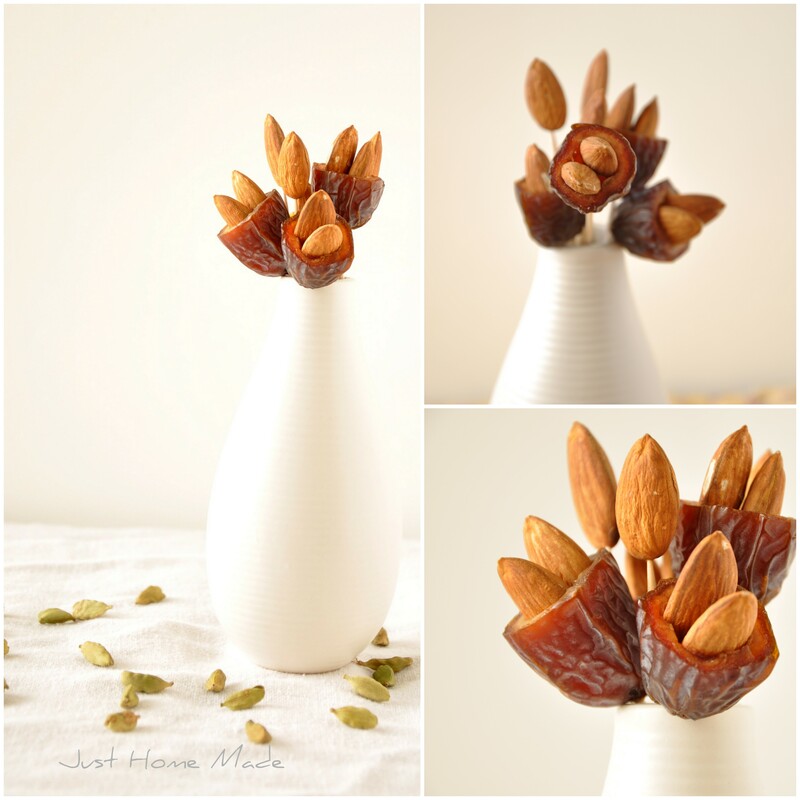 To skin the almonds, hold the almond on one end and gently squeeze to pop the skin off the almond. Repeat with the rest. 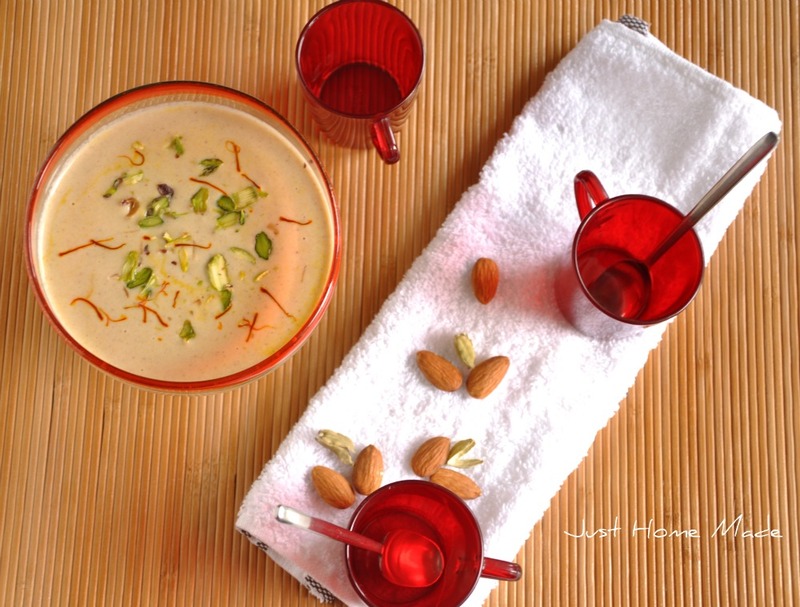 In a blender, grind skinned almonds and chopped dates along with a cup of water to a smooth paste. Heat ghee in a thick bottomed pot over medium-high heat. When ghee is hot enough, add chopped cashews and shallow fry until golden brown. Strain cashews over a tissue and keep aside. Pour the date-almond smoothie into the thick bottomed pot and bring to a slow boil over medium-low heat stirring intermittently. In a saucepan, bring milk to a boil or heat milk in a microwave for 1 min, add the saffron strands, stir and keep aside covered. 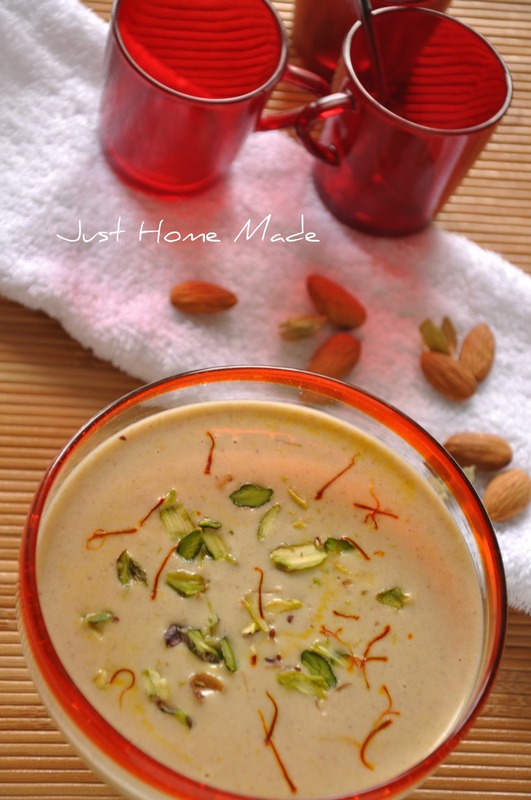 When Kheer starts bubbling, add the saffron milk and sugar and simmer for about 10 mins or until sugar is fully dissolved. Switch off, sprinkle ground cardamom, give it a good stir, cover and keep aside. A mortar and pestle works best to powder cardamom seeds. Freshly ground is always the best, cardamom gradually loses flavor once ground. Saffron yields color beautifully when in hot liquids (just like coffee) and hence added to hot milk. At any given point, try not go beyond medium heat. You don’t want some precious dessert and $$ going down the drain, do you? Excellent Radhika, Love your styling ! Perfect Recipe – First of all thanks to you for this wonderful recipe !! Quick Question: do I still need to add sugar when the dates already have so much sweetness? I am thinking if I can skip the sugar ,but not sure!